What does ''biodegradability of polymers'' mean? The first criterion for biodegradation is enzymatic processing. In particular, hydrolyzable polymers such as polyesters and polyamides are enzymatically degraded into monomers (depoly-merization process) that can easily enter central metabolic processes unless they are xenobiotic compounds. Most monomers are naturally occurring compounds, such as organic acids, alcohols/glycols, and amide compounds. Proteases, lipases, and esterases originating from animals, plants, and microbes can hydrolyze xenobiotic polymers such as polyamides and polyesters, and PLA, although their original substrates are proteinaceous compounds, lipids, and esters. This is well explained by the fact that enzymes cannot discriminate between original substrates and substrates analogous to them. 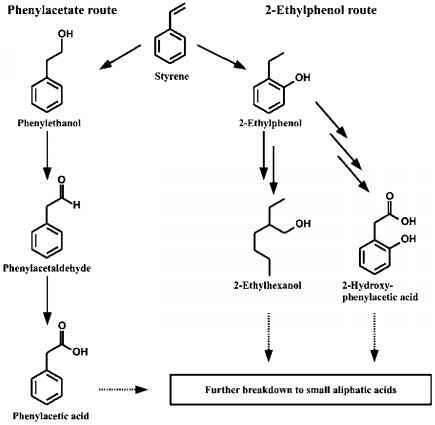 For example, proteinase K can degrade PLA because lactic acid is analogous to alanine. The second and most important criterion for biodegradation is microbial degradation of target polymers, which are often assimilated by microorganisms as sole carbon and energy sources. pathways. Generally, esterases/lipases contribute to the hydrolysis of synthetic polyesters. PHA- and PLA depolymerases are also categorized as polyester-degrading enzymes, but their enantioselectivities and substrate specificities indicate that there are three categories of polyester-degrading enzymes, general lipases, PHA depolymerases, and PLA-degrading enzymes (Tokiwa and Calabia 2004), although some cross these boundaries. PHA- and PLA-degrading microorganisms have different specific depolymerases for PHA and PLA, respectively. Thus the biodegradability of a given polymer is not uniform, and its evaluation requires substantial insight, even if the basic chemical structures and underlying mechanisms are the same. On the other hand, some synthetic polymers are oxidized repeatedly and are cleaved exogenously by one terminal monomer unit that is assimilated as a carbon source into the central metabolic pathway. 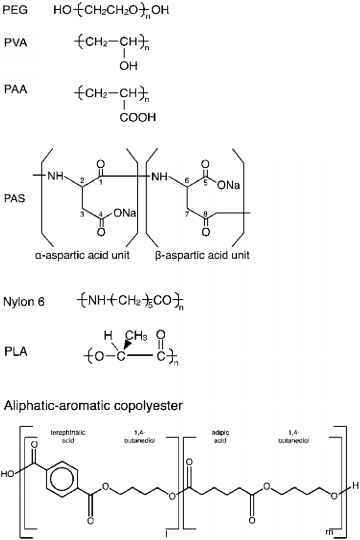 Typical examples of exogenous depo-lymerization are the oxidative degradation of polyethers, PAA, and probably polyolefins by a series of oxidative steps for polyethers, and b-oxidation-like processes for PAA and polyolefins. PVA is degraded by a combination of primary oxidation and hydrolysis of oxidized PVA, as described below. Except for PVA, high molecular weight carbon-backbone polymers are recalcitrant to biodegradation, although their oligomers, including polyethylene wax (PEwax), isoprene oligomers, styrene oligomers, and triacrylonitrile, are biodegradable (Kawai 1995). Hetero-backbone polymers are more susceptible to biodegradation than carbon-backbone ones. Examples of the former are polyethers, such as PEG, most polyesters, including PHA and PLA, and polyamides, such as PAS (polyaspartate).